In our era of social media overload, new network-driven apps have a hard time building an audience. So when users start deactivating Facebook in favor of your app, it probably means you’re onto something. 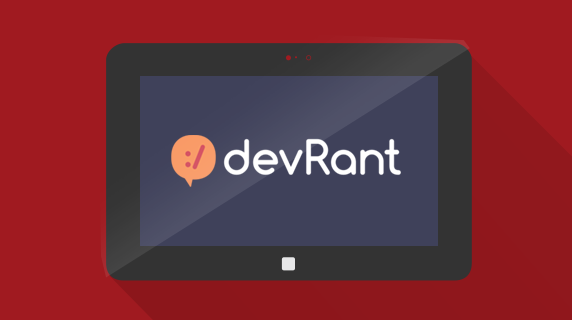 This is what happened to devRant, an app created by developer David Fox and designer Tim Rogus. Fox and Rogus worked together at their previous company, and as devs tend to do, frequently found themselves discussing—or ranting—about various injustices. The two realized that there were plenty of places to discuss the technical aspects of being a developer, but none for bantering about workplace gripes. And so, the idea for devRant was born. The social network for developers gives users what Facebook, Twitter, StackOverflow and other venues cannot: a forum to express how they really feel with others who can relate. Fox and Rogus started working on devRant in late 2015. Previously, they had always developed iOS-first, but they knew they’d be missing a core developer audience if they didn’t launch on Android as well. By using Appcelerator Titanium they were able to build cross-platform and serve both iOS and Android users. There were other benefits as well. According to Fox, “Titanium allows us to launch new features really quickly and have an immediate impact. For example, we added an avatar builder with millions of configuration options, yet it only required a few lines of code to be different between iOS and Android.” The update was met with rave reviews on both platforms. Early on, Fox and Rogus looked to their developer-users for feedback. After releasing an MVP, they let users decide what should be added or changed. Among those changes was the approach to voting rants up or down. What started as “+1” and “-1” soon got a dose of programming humor, and became “++” and “- -”. Now, with around 18 thousand registered users since launching in March, articles in TNW and Forbes, and status as a recommended app in the Google Play store, devRant has clearly found its niche. The team also recently released desktop feed beta, so devs don’t even need to leave their workstation to air their latest grievance. As for what’s next, Fox and Rogus have their sights set on growth, which includes building in an achievement system to further gamify the app. And as they continue to grow, the two founders won’t just be working behind the scenes—they’ll be participating in conversations with the rest of their community. Great article! I have been using devRant and it is a wonderful resource for develops. Thanks for this article. Hi Berik – Appcelerator does not provide that service. But, feel free to contact devRant.